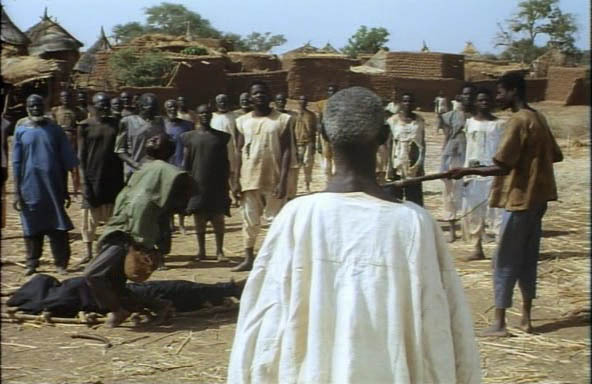 Ouedraogo, from Burkina Faso, was a student of Gaston Kabore, director of last week’s Wend Kuuni, and also worked with Ousmane Sembene. Saga (actor also in Moolaade, Yaaba, Night of Truth) has been away for a couple years, and returns to find that the woman he was promised as a wife is now married to his father. She and Saga are in love and resume their affair, with disastrous results. Saga’s brother is sent to kill him, but allows him to escape, and the illicit lovers go off to Saga’s aunt’s house… but he comes back for his mom’s funeral, exposing himself to the townspeople. The father banishes the brother, who then shoots Saga, oh and the girl’s dad hangs himself for having a part in all this. Fine story (a darker Ten Canoes? ), fine acting, plays at a good pace, not at all as bleak and awful as it sounds from my plot description. Won the Cannes Grand Jury Prize (a step up from the prize Yeelen won three years before), second place to Lynch’s Wild At Heart and beating out Godard, Zhang Yimou and Ken Loach. Little music. A vocalist sings “Tilai… Tilai” a couple times and that’s it. Long shots, but not distractingly long.